One-story adobe plastered with a wood-shingled steep gable roof. Overhang forming a porch with four plain wooden columns. Recent 6-foot wall of large, painted adobe bricks added. Designated City of Santa Barbara Landmark (07/13/1982). 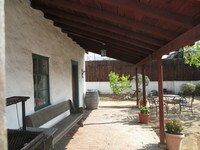 The Buenaventura Pico Adobe was built as a home for Buenaventura and Anita Pico c. 1820. 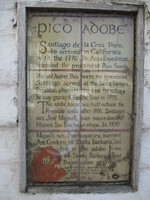 It was built near the outside wall of the old Presidio. 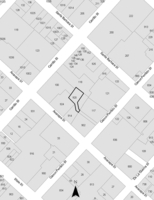 It has been undisturbed due to its location far away from the streets and is now the property of the Santa Barbara Historical Trust for Historic Preservation. 2) Its exemplification of a particular architectural style and way of life to the City.